Liberty Square (also Freedom Square) is a public plaza covering over 240,000 square meters in the Zhongzheng District of Taipei, Taiwan. It has served as the public gathering place of choice since its completion in the late 1970s. The name of the square recalls the important historical role it played in Taiwan's transition from one-party rule to modern democracy in the 1990s. Liberty Square serves as a major site for public gatherings in Taipei and is home to three major landmarks as well as civic parks. At the east end of Liberty Square stands the National Chiang Kai-shek Memorial Hall. The square is flanked by the National Concert Hall on the north and the National Theater on the south. A park surrounds the plaza and a wall surrounds the site. The square sits within sight of the Presidential Office Building. 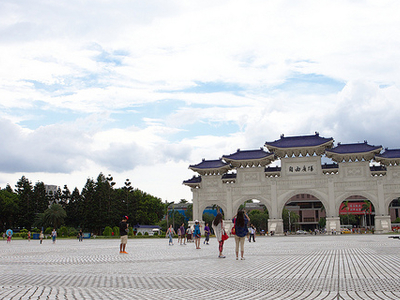 Liberty Square regularly serves as the site of mass gatherings in Taiwan. It is the scene for red-carpet ceremonies when Taiwan's president greets foreign dignitaries. Crowds gather at the square throughout the year for outdoor festivals and concerts. 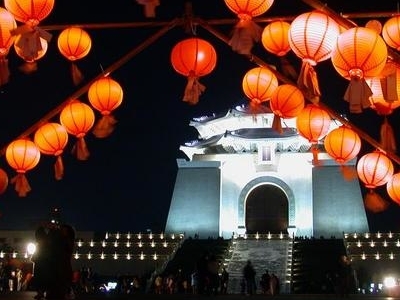 The Taipei Lantern Festival regularly takes place on the square. On many days students, athletes and soldiers may be seen at the square, working on drills and dance routines. The National Theater and Concert Hall host over 800 events every year and provide iconic backdrops for events on the square. The ponds and parks surrounding the memorial and cultural centers feature well-maintained lawns, trees, and pathways. The ponds are filled with colourful koi traditionally found in gardens in East Asia. 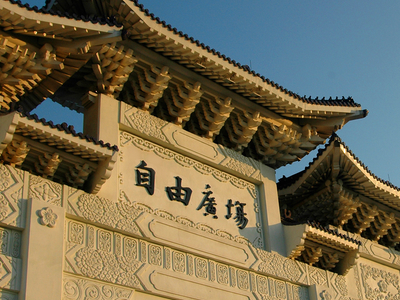 The parks regularly play host to quieter forms of public activity, such as Go games and taekwondo, T'ai chi ch'uan and other martial arts practices. Here's the our members favorite photos of "Plazas and Squares near Zhongzheng". Upload your photo of Liberty Square!